전주이씨 고림군파 종중 문서 일괄(全州李氏 高林君派 宗中 文書 一括)은 조선 연산군 8년(1502)부터 선조 26년(1593)까지의 고문서 4매이다. 재산을 나누는 문서인 허여문기(1502) 1매와 재산 주인이 죽은 후 그의 자식들이 모여 합의하여 재산을 나눈 문서인 동복화회문기(1528) 1매, 동복화회입의(임진왜란 이전) 1매, 동복화회성문(1593) 1매 등이다. 이것들은 태종의 둘째아들 효령대군의 손자인 고림군 이훈(李薰)과 그의 아들 칠산군 선손(璿孫) 양대간에 재산을 상속하고 자녀들에게 분배한 내용이 담긴 문서이다. 허여문기와 동복화회문기는 고림군 이훈이 그의 아들 칠산군에게 양여한 문서이고, 동복화회입의와 동복화회성문은 칠산군이 그의 친 형제자매와의 합의를 통해 그들에게 재산을 분배한 문서이다. 조선시대 왕실 내에서의 재산상속에 관한 연구와 경제사 연구에 있어서 귀중한 자료로 평가된다. 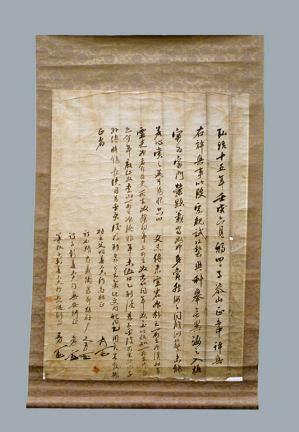 The documents of the Gorimgun Branch of the Jeonju Yi Clan include four documents ranging from 1502 (the 8th year of the reign of King Yeonsangun of the Joseon Dynasty) to 1593 (the 26th year of the reign of King Seonjo). They include a Heoyeomungi (distribution record of inheritance, 1502), Dongbokhwahoemungi (agreement between the children of a deceased to divide the inheritance, 1528), Dongbokhwahoeibui (published before the Japanese Invasion of Korea in 1592), and Dongbokhwahoeseongmun(1593). They contain the details of a property succession and the distribution of property made by Gorimgun Yi Hun, a grandson of Prince Hyoryeong, who was the second son of King Taejong, and Chilsangun Yi Seon-son, a son of Yi Hun. The Heoyeomungi and Dongbokhwahoemungi were transferred to Chilsangun by Yi Hun; while the Dongbokhwahoeibui and Dongbokhwahoeseongmun were drawn up when Chilsangun distributed his properties to his brothers and sisters. They are considered important documents for studies on property succession in the Joseon Royal Court and the history of the economy during the Joseon Dynasty.